Dad says they’re always cleaning balloons up in the waterways. And while a latex balloon will eventually biodegrade, it can still linger long enough to muck things up. Let’s keep them in the air where they belong. No one wants to see deflation. Kim’s parents spend time every year cleaning up MacArthur State Park’s intercostals via Kayak. They’ve seen manatee, dolphin, stingray, and many of the other bird and sea species native to West Palm Beach, Florida. At the mention of balloons as ephemeral decor for a fundraiser, her dad griped at how the balloons always make a mess and they find a ton of them during their cleanups. Although balloons are biodegradable, they can damage wildlife while they slowly decompose. And don’t even get us started on the mylar variety. However, why does a balloon come down at all? As denizens of the sky, shouldn’t balloons join the clouds? 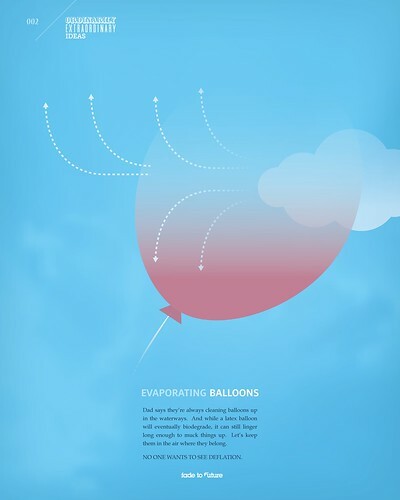 Tagged art, balloon, cloud, concept, design, environmental, evaporating, extraordinary, Graphic Design, idea, modern, ordinarily, poster, Posters, Print, prints. Bookmark the permalink.